Prominence Quark Question - SolarChat! I was hoping that I could get some feedback from anyone in the group who is using a Prom version of the Quark from Daystar. Ideally some sample images and details on the filter (standard/Questar/Combo version), and some info on the scope used to capture the images. You can post here or PM/email me. With upcoming solar minimum I decided earlier this year to go for standard Prominence version. Swimming against the going purchasing current of Chromo version. Just the attached versions I immediately have available on this unit, but more can be found on my Facebook account. Look for Hans Hoogkamer. Moon and Sahara picture as profile pics. Can ask me to become friend. I am using the Quark on WO 81GT and TS 102ED and must say that, in contrast to my expectations, the surface details show up very well. It is just my processing technique that needs improving. Turning the knob counterclock wise giving better surface image, turning clockwise better prominences. Have no experience with the chromosphere version so cannot judge which better, but bottom line I am very happy. Last edited by MAURITS on Wed Feb 13, 2019 6:14 pm, edited 1 time in total. Very nice images, Hans ! Thanks for posting the sample images through the Prom Quark. As you say, the disk details came up quite nicely with it. Your processing is good too! I have spoken with Daystar on several occasions about how it would compare to the Chromosphere model, but it is always nice to see first hand examples. I believe that most in the group are using the Chromosphere version, which gives me lots of examples to compare to. I will see if I can access the Facebook images...I don't use it but see what I can access. I have understood before that the Prominence version basically is a rejected Chromo version, but that the checking in Daystar is not very consistent. In that case one can be lucky to have a Prom version in hands that, by quality, meets the Chromo standard. Maybe I am one of the lucky ones here..
Two more pictures to give an idea about possibilities of the Quark Prom version.. Both shot with the WO 81GT. The TS 102ED I recently bought, made abt 50Gb of data but sofar did not find the time to process, but the AVI's basically looking good. Personally I favor Prom pictures, but won't let a nice AR in peace, specially when closer to the disk edge. Hans, very nice images with a beautiful color scheme. The proms are so nice and crisp. Thanks for the additional images Hans, they show a lot of detail for the Prom version. Is the wider FOV image with the disk and proms from a single stacked video stream, or separate images of the proms and disk in a composite image? If it is a composite they are very well aligned and even. My pleasure to send some of what I have..
Tnx to all for the heads up.. The widefield is composite of prom and disk indeed. On my 102ED I make each time 3 avi's. Disk, proms and spiculae. I did not manage yet to get them all 3 in a composite to my satisfaction. Perhaps anyone tips based on processing in photoshop ? Your disk/limb composite is very well done, so I don't think I can give any better guidance! I have tried the original Prominence Quark of our local club, it was a BRIGHT orange view compared to my original Chromosphere Quark, but there was almost no surface detail visible at all in the Prominence version with a 32mm TeleVue Plossl at 105x in my Meade StarNavigator 102mm F7.8 Achromatic refractor (a lot of plastic and terrible focuser and mechanical slop in this 'scope). In comparison my original (i.e. not Combo) Chromosphere Quark is a much darker view at the same magnification, but far more surface detail was seen, with a mid red color view, and the Proms were much dimmer and rather less of the faint structures seen on the Proms. I feel that with my F/8 'scope the view is a little too dim for visual use with this Quark, I would instead like to try an F6.5 Achromat with good mechanical quality of between 100mm and 150mm (my next purchase!). Less aperture than that and the image scale (size of proms etc) doesn't make it worth setting up and I would rather use my Lunt 60 instead. But the Lunt runs out of brightness and can't get near my Quark view for image scale. So ideally I would have all 3, both Quarks and the Lunt. Indeed I keep thinking about using the Prom Quark again from time to time, because of it's sheer bright detailed view of proms. Just to play a little devil's advocate, but if you have the chromosphere version and want to see similar to what the prominence version does, simply use a fast focal-ratio instrument, such as an F5 refractor, the bandpass will be wider which will make prominences brighter and then if you slightly tune towards red wing, it will be quite similar and bright. Mean while, you can tighten things up by increasing the focal-ratio, say to F35~40 or more, to get more narrow bandpass and higher contrast, and if you slightly tune towards blue wing, the surface contrast is much higher. Sorry I let the replies slip by, I only found them this morning. 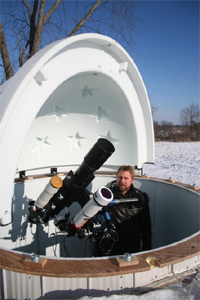 My main interest was to evaluate the use of a quark to DS my DSII etalon on the modded 150mm, f8 OTA. I planned to place it between the pressure tuned DSII etalon and a the camera (either with the built in telecentric or add my own with a Questar version)...wondering if the Prom version would be sufficient to boost the contrast or does it need the narrower Chromosphere version? I am not looking to get a super narrow bandpass out of this, just to improve the single DSII image. When conditions and features warrant higher end filters I can always set up the 0.45A Quantum...just wanted something quick to be able to install to boost the current setup. As I see the setup, a standard Quark will likely need a telecompressor or I add a 2.5 or 3x telecentric to get where the scope seems to work best.